An adorable Basset Hound without no known name leapt into collective hearts and minds on 17th September 1972, when a dozy beast, who would later simply be known as ‘Dog’, made his screen debut in Columbo Season 2 opener Etude in Black. So started a love affair between man, dog and viewer that would last for well over 40 years. Known for his lethargy and a propensity to howl when it was least wanted, the cute critter would go on to grace many classic episodes, including Playback, Try and Catch Me, Forgotten Lady, Mind Over Mayhem, How to Dial a Murder; Most Dangerous Match; Make Me a Perfect Murder and Now You See Him. 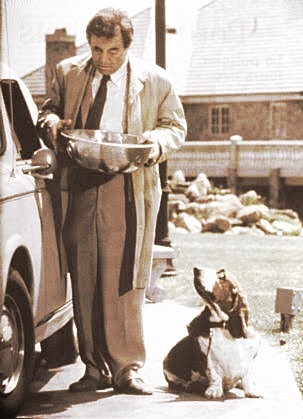 Dog would become the single most featured recurring guest character in the show, becoming nearly as synonymous with the Lieutenant as the cigar, the raincoat and the beat-up car. Yet it almost didn’t happen. When writer Steven Bochco attempted to introduce the canine sidekick, Peter Falk was resistant. There were already too many gimmicks, he thought. Do we really need another? But when Bochco introduced Falk to the slovenly hound it was apparently love at first sight. Falk accepted that the beast was exactly the type of dog Columbo would own. The rest, as they say, is history. Introducing Dog was Bochco’s way of quietly raising two fingers to the studio, who were pushing for Columbo to have a regular human sidekick to interact with. Bochco and character co-creators Richard Levinson and Bill Link were dead against the idea. Ironically Sergeant Wilson was introduced in Season 2’s Greenhouse Jungle – the very next episode after Dog’s debut. Wilson was just what Universal were wanting. But he wouldn’t reappear until Season 5’s Now You See Him – funnily enough another episode featuring Dog. 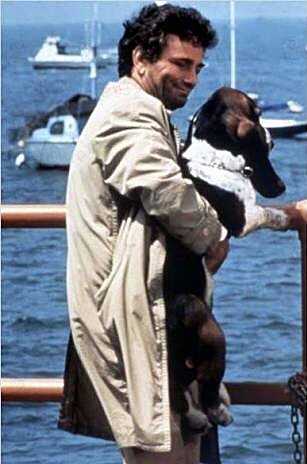 Although the relationship between Columbo and Dog was wonderfully warm and genuine, having a dog on set did cause some low-level difficulties. Sadly the first incarnation of Dog died and had to be replaced. The new version was somewhat younger, and required to be made up to look more like the original. Falk himself recalls that the dog required much more time in the make-up chair than himself. Still, it do no damage to their on-screen chemistry and, such was his popularity, Dog also survived the transition to the ABC years, popping up sporadically through the 90s in episodes such as Murder: A Self Portrait and It’s All in the Game. He first appeared in Etude in Black in September 1972. Rescued from the pound, Columbo spends most of the episode trying to figure out a name for the mutt. Fido and Beethoven are options that fall by the wayside. Although he doesn’t appear, Dog is hilariously referenced in Negative Reaction as pining for next door’s cocker spaniel who has moved away. Columbo asks murderer Paul Galesko if he has a photo of a cocker spaniel to ease Dog’s suffering. Galesko is, shall we say, not amused…? Dog indirectly helps Columbo crack the case in Most Dangerous Match when he nearly blunders into the trash compactor. A helpful worker points out that the machine has an auto cut-off function in such instances, leading the Lieutenant to realise that a deaf man was the killer! ‘Dog’ is not overtly said to be the animal’s name in the 70s. In Mind Over Mayhem, Columbo states that they just call him ‘you’, ‘dog’ or they just whistle – and that it doesn’t matter because he never comes anyway. Dog is memorably taken for a walk by robot MM7 in the same episode. It’s a relationship so beautiful it’s even been immortalised in bronze on the streets of Budapest, Hungary. Why is there a Columbo statue in Budapest? Find out here. If you know of someone who’s had a bad day, don’t be afraid to forward this article onto them. 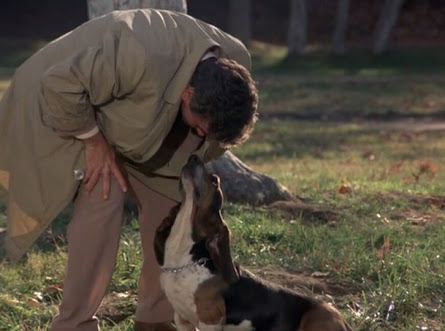 The simple love between man and dog exhibited in Columbo always makes the heart sing! 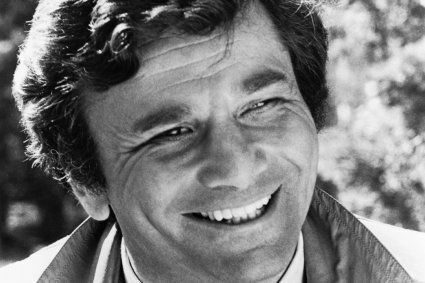 Tags: Columbo, Columbo statue, Dog, Etude in Black, Forgotten Lady, Greenhouse Jungle, How to Dial a Murder, It's All In The Game, Make Me a Perfect Murder, Mind Over Mayhem, Most Dangerous Match, Murder: A Self Portrait, Negative Reaction, Now You See Him, Peter Falk, Playback, Steven Bochco, Try and Catch Me. Bookmark the permalink. Previous post ← Why is there a Columbo statue in Budapest? In your wonderful heartwarming story about Dog, you overlooked the episode in which he was hero! I’m talking about Ashes to Ashes where he accompanies Columbo into the victim’s residence then starts barking around the glass doors. Columbo ignores him until they discover 11 photos of a dog to which the victim’s assistant excitedly responds “I completely forgot about Louella!” He then opens the glass doors and the door to the pantry where they find the little puppy without food or water! Then Columbo realizes what Dog had been trying to tell him all along! Lesson: Pay attention to the dog-they know much more than they’re given credit! Thank you for your tribute. I hope you will do one for Jim(aka Suzy Q-my dog would love a photo of her)from Mike and Molly; Boomer Reggie and the newest Steve from the Jessie Stone tv-movie series; and of course Martin the star of the new series Downward Dog, which I hope they give a chance to succeed(unlike other series like Three Rivers(outstanding true-to-life tribute to a worthy cause) that they killed before it had a chance to develop! Not that Alex O’Laughlin’s series Hawaii Five O isn’t great but that’s because he’s an incredible actor, which made Three Rivers and the other series that received a stake through its heart much too soon-Moonlight! 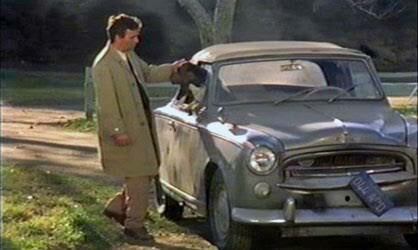 A lovely tribute to a really popular member of the cast – it’s always great to see Columbo with Dog. I particularly like it when Dog is eating ice cream. Ha, good follow-up to the statue post, and lots of great pics. Dog may have been a gimmick too far, but he was hard to resist, obviously. Good post! I don’t think Dog needed to return for the 90s series. Are we supposed to believe it’s the same creature in order to feel comforted? But he was a little cutie in the 70s and a very good fit for the Lt. Good casting, as usual! Did you know that “Dog” also portrayed Henry on Emergency? He too was quite lazy, lying on the couch in the firehouse. I didn’t! Good fact. I’ll add that to the article. Thanks very much.